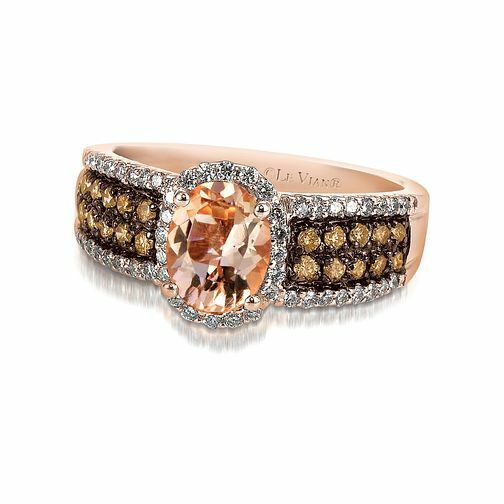 A luxurious Peach Morganite stone lies at the centre of this beautiful Le Vian 14ct Strawberry Gold ring. Framed with a radiant circle of sparkling Vanilla Diamonds and finished with an irresistible combination of Vanilla and Chocolate Diamond set arms. Matching band: 2366843. Le Vian 14ct Strawberry Gold and Peach Morganite ring is rated 4.4 out of 5 by 7. Rated 5 out of 5 by Anonymous from Fab ring A stunning ring, have the opal version of this gorgeous ring as my engagement ring with matching wedding band, unfortunatly have been very clumsy and damaged the opal for a 2nd time and is currently in repair. Had my eye on this one for a while and as it went into sale my lovely hubby bought me this one as a treat, am over the moon, sparkles and glints as expected with Le vian. This is my fourth ring from Le vian and I am hooked .